Based in Barcelona, the Modern Troubadours Company travels around the world, organising performances and workshops of music and storytelling. The Modern Troubadours is all about connecting people through music and stories and learning about each other's cultures and backgrounds. Folk stories form an important part of a country's history and culture. They are a national heritage and contain the entire culture of a community, which has followed this way of life through generations. By discovering these stories and playing music together, we learn about each other's roots, and therefore can understand and respect each other better. Music and stories are powerful tools for connecting people, no matter where they are from, bringing them together and passing on an important message about love, tolerance and respect. A troubadour was originally a travelling musician during the medieval period. They would write poetry, create music to it and travel from village to village (or even country to country) singing their songs. These songs mainly dealt with chivalry and courtly love but they also told stories of far away lands and historical events. We, in turn, can become "modern troubadours" by learning about each other's cultures and history and teaching it to others through our music. 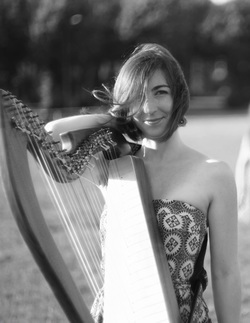 Harpist, storyteller and workshop leader, Sarah Nichols, has an unusual international background, giving her an exciting array of stories to tell. Born and educated in Paris, where her parents settled, Sarah is the daughter of a Rhodesian (Zimbabwean) mother and Welsh Patagonian father. She currently lives and works in Barcelona, Spain. Until 2016, she lived in the Netherlands, where she graduated in 2013 with distinction from the NAIP Joint Music Master at the Royal Conservatoire of The Hague, after having received, in 2011, her Bachelor's degree in music and pedagogy. Sarah has performed and given workshops in various European countries, in the USA, Zimbabwe, South Africa and Nepal. She has recently become interested in the ancient art of storytelling and has combined this with her music. She is known to be a versatile artist, performing in a variety of styles, from classical to contemporary music and music theatre. Sarah also works with various music educational groups, such as MEMO Foundation (Memorabele Momenten), which encourages children to discover music through daily interactive performances; and "Wonderland" which offers music and dance improvisation concerts for children. In 2013, she started her own company of Modern Troubadours, to explore further the art of storytelling and music. 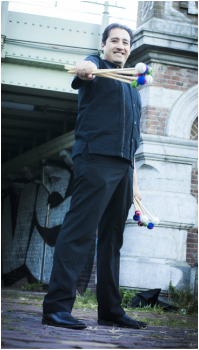 Aldo Aranda is a Mexican percussionist, living in the Netherlands, with an exciting international career. He has performed and worked with renowned conductors, composers, theatre companies, ensembles and orchestras such as Placido Domingo, Neeme Jarvi, Louis Andriessen, Heiner Gobbels, Troubleyn/Jan Fabre Company, Asko-Schoenberg Ensemble, Symphonic Orchestra Carlos Chavez and Mexican Fine Arts Opera orchestra. As a soloist, he has premiered more than 15 different pieces from Latin American, Asian and European composers and commissioned new pieces for Chamber Ensemble, Marimba and Percussion to renowned young composers from Europe, Mexico and USA. Aldo has also made several tours in Asia, Europe and Africa and given recitals and concerts in the main halls of Mexico, as well as being invited to the most prestigious festivals such as “Festival d’Avignon”, “Aarhus festival”, “Gaudeamus Music week”, “Netherlands Music Days”, “Sonic Visions” and “Cervantino International Festival”.